I still had some pizza dough leftover from what I made recently and decided to put it to use last night. I had made a pot of turkey chili, one of Michelle’s favorites but one of Sean’s least favorites. Michelle and I both like it but Sean is not a big fan and was looking for something else to eat. 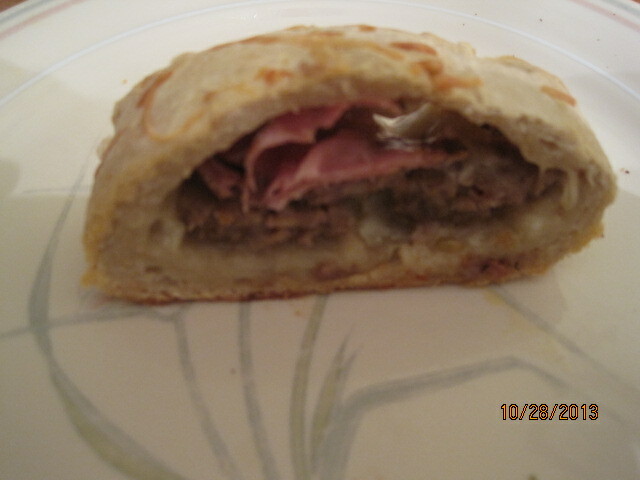 I decided to make use of some leftover items such as the pizza dough and sausage and make a stromboli. I have made one before using Scott Conant’s recipe and it was very good, but I decided to try something a little different this time and gave this one from Emeril Lagasse a shot. Preheat the oven to 375 degrees. Oil a large baking sheet or place a baking stone in the oven to heat. In a large skillet, cook the sausage over medium-high heat until browned and the fat is rendered, about 5 minutes. Remove the sausage with a slotted spoon and drain well on paper towels. Discard all but 1 tablespoon of the fat from the skillet. Add the onions and bell peppers and cook, stirring, until very soft, about 4 to 5 minutes. Add the garlic and Italian seasoning and cook, stirring, for 1 minute. Remove the skillet from the heat and allow the mixture to cool. Punch down the dough and on a lightly floured surface roll the dough out into a large rectangle, about 10 inches by 14 inches. Spread the cooled sausage mixture across the dough, leaving a 1-inch border on the edges. Overlapping slightly, layer the ham, pepperoni, mozzarella and half of the Parmesan cheese over the top of the sausage mixture. Using a pastry brush, paint the border of 1 long edge with the egg wash. 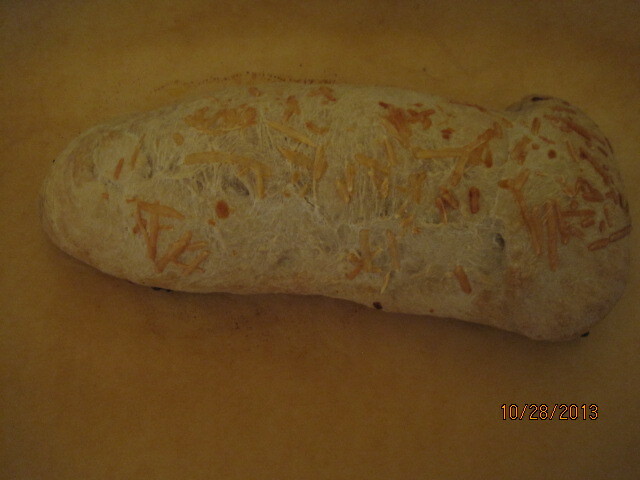 Starting at the opposite long end without the egg wash, roll up the dough into a cylinder, pinching the edges to seal. Place on the prepared baking sheet and allow the dough to rise for 20 minutes. Brush the top of the stromboli with the egg wash. Bake until nearly golden brown and starting to crisp, about 20 minutes. Sprinkle the top of the stromboli with the remaining Parmesan cheese and return it to the oven until the cheese is melted and the dough is golden brown, about 5 minutes. Remove from the oven and allow the stromboli to stand for 10 minutes. Slice thickly and serve. The great thing about stromboli is that you can really put anything inside it. Sean is not a big fan of the peppers, so I left them out and put some extra ham and cheese inside instead. You could just as easily put leftover chicken in there or any other vegetables you may like and have on hand. You can even just do vegetables and cheese if that is what you prefer. I am guessing Sean liked it since he devoured it. 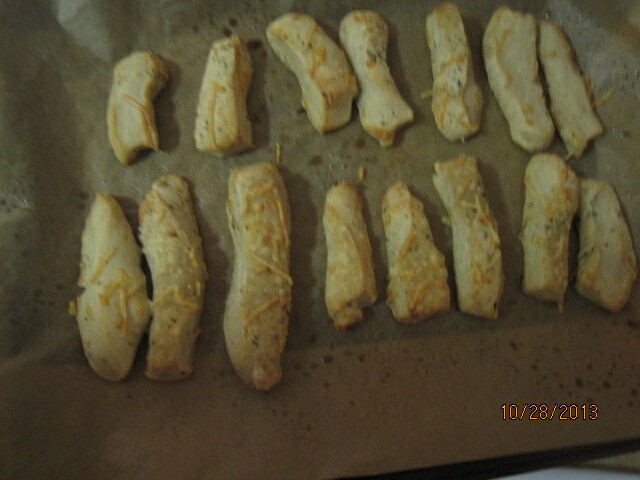 Since I still had a little bit of pizza dough left, I decided to make some small breadsticks with what I had leftover. This is a very simple way to make use of some leftover pizza dough if you happen to have some around. Place the pizza dough on a lightly floured surface. Line a baking sheet with parchment paper and spray it with cooking spray. Preheat the oven to 425 degrees. Roll the dough into a rectangle and cut the dough into 12 to 15 thin strips. Place the strips on the baking sheet and cover the dough with a towel and allow it to rise for 20 minutes. Sprinkle the olive oil over the dough to coat the breadsticks. Sprinkle the breadsticks with the Italian seasoning and the Parmesan cheese and bake in the oven until they are golden brown, about 10-12 minutes. You can use the breadsticks to go along with any type of meal, like spaghetti and meatballs or any other dish that you like. Michelle and I used them with our chili and they were quite tasty. They came out perfectly with just the right amount of seasoning. That’s all I have for today. Check back next time for some more recipes to try. Until then, enjoy the rest of your day and enjoy your meal!